Aerocool Advanced Technologies, one of world’s leading manufacturers of excellent gaming PC gear, announces the new Strike-X Cube chassis, which is featuring Aerocool’s unique X-Design and a wide range of functions, such as the built-in fan controller, large acrylic window in side-panel, two pre-mounted case fans and much space for latest high-end PC components. The Strike-X Cube is available in three different color versions: Black Edition, Red Edition and White Edition. Aerocool was able to shrink the Strike-X Cube to the dimensions of 435 x 280 x 412 mm without compromising the compatibility and usability. It is possible to create amazing gaming systems based on latest Mini-ITX and Micro-ATX motherboards and at the same time display them properly inside the Strike-X Cube thanks to its large acrylic window in the side-panel. Special effort has been made to make the mounting process of the system components much easier and convenient. Users can simply remove the mainboard-tray to install the main components, such as mainboard, memory, CPU and CPU cooler. Both conventional air-cooling solutions with a maximum height of 187 mm and water-cooling solutions with dual 240 or 280 mm radiators are supported by the Strike-X Cube. For better guiding of water-cooling tubes, two pre-drilled holes are located on the rear side of the chassis. VGA cards with a total length of 320 mm can be installed in standard configuration. With the front fan removed, even larger VGA cards with 345-millimeter length are supported. Up to six fans can be mounted inside the chassis. Two case fans are already pre-installed by the manufacturer. One big 200 mm fan is located in the front, spinning with 800 rpm (53,4 CFM) at silent 26,5 dBA. Another 140 mm model with 1.200 rpm (59,48 CFM, 27,6 dBA) is located on the rear side of the Strike-X Cube. Mounting process of the power supply unit has been improved as well, by implementing a removable PSU bracket. PSU location has been changed so that the PSU fan faces towards the side-panel, hence allows support of a much wider range of PSUs without length limitation. This layout gives more room for cable routing and offers additional cooling possibilities. The modular concept applies even for optical drives, hard drives and solid state disks. Both the ODD and the HDD racks can be removed completely for easy installation. The HDD rack supports tool-free mounting of three 3,5-inch or 2,5-inch drives. Additional two 2,5 inch drives can be installed under the 5,25 inch bay in the ODD rack. The Strike X Cube chassis feature pre-drilled pass-through holes for cable management with rubber-protection, a magnetic and removable PSU dust filter and shock-proof rubber pads for 3,5 hard drives and the power supply unit. The well-equipped I/O panel located in the top-panel offers two USB 3.0 ports, one headphone and Mic jack. Another highlight is the integrated fan controller for fans with up to 15 watts power consumption. The Strike-X Cubes are made of robust 0,7-mm steel and have been reinforced by Aerocool’s unique side bar design, making them a great choice for high-end gaming systems, which can be even easily taken to a LAN party. 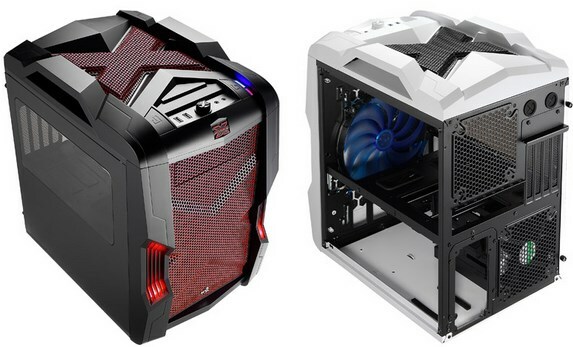 The Aerocool Strike-X Cube models are available at etailers and retails starting this week. Suggested manufacturers price is set at 120,90 $USD (excl. Taxes).